I've got a few more Nigella Kitchen recipes to share. Today's theme: Salads! 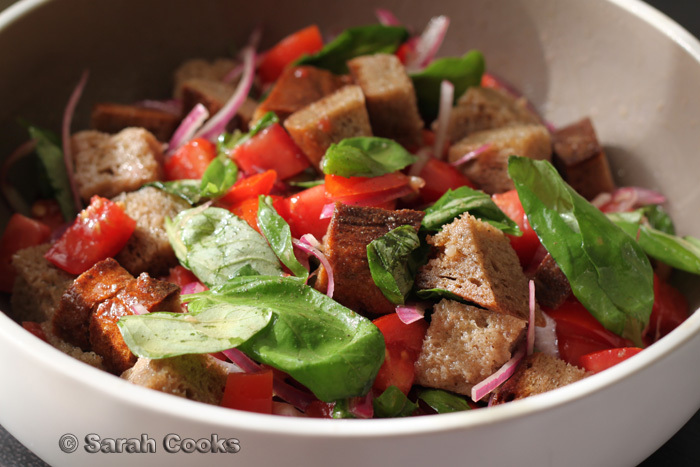 I knew I would love Nigella's panzanella (Italian bread salad) as soon as I read the recipe. The dressing starts with some finely sliced red onions, soaked them in red wine vinegar. Always delicious. (Remember?) There are also stale bread cubes, basil leaves and diced tomatoes. A classic combo of flavours - you couldn't really go wrong! Nigella's version majors on the bread, and looks rather like a big oil-soused pile of bread cubes, but I tried to keep all the elements a bit chunkier and separate. I think it looks prettier that way, don't you? This recipe is included in the Cook it Better chapter, which is focused on using up leftovers productively. Antithetic, I know, but I really luxed it up, by adding a ball of DOP buffalo mozzarella. Proper buffalo mozzarella is a world away from those depressing (and surprisingly pricey) little bouncy bocconcini balls they sell in the supermarkets. Fabulous! 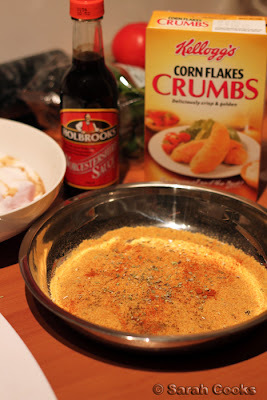 This recipe for crumbed chicken, (from the What's for Tea? chapter), just sneaks into the 'salad' category thanks to the salad on the side. 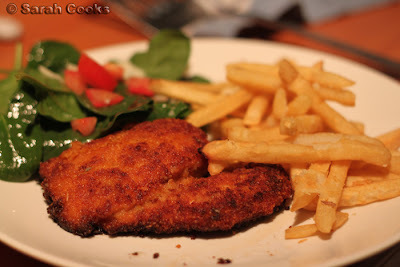 Schnitzel was one of the first things I learned to cook (along with pancakes and mustard chicken), but I've picked up some tips from Nigella to make it even more tasty. Here, the chicken is marinated in buttermilk and mustard, and coated in crumbs mixed with oregano, grated parmesan cheese and cayenne pepper. You could use any breadcrumbs (and I think Nigella recommends panko), but I couldn't resist the brightly coloured box of Cornflake crumbs. The side salad is made of tomatoes, spinach leaves and parmesan shavings, with a dressing of red wine vinegar and olive oil. Come to think of it, the crispy chicken and salad is rather like her crunchy pork chops, from the Ultimate Feasts chapter of Feast. Equally wonderful. 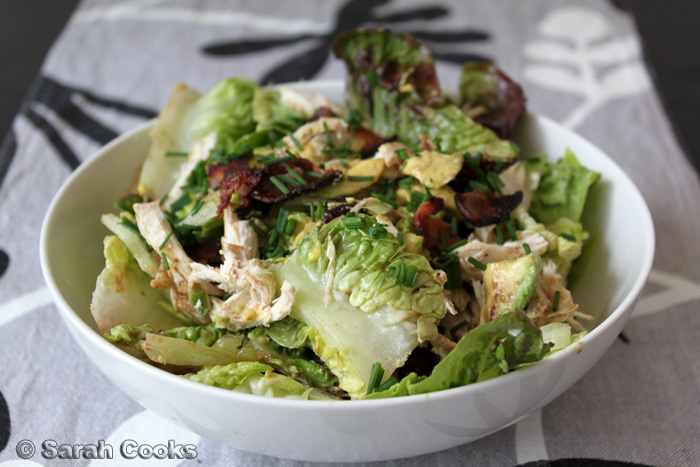 This salad is suggested as a way of using up leftover chicken meat from the praised chicken. 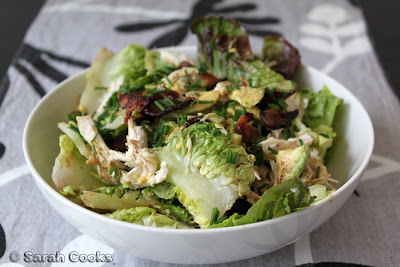 Simple: chicken meat, lettuce, avocado, crispy fried bacon pieces, chives. It's dressed with a punchy mixture of mustard, vinegar and the unfortunately named, but undeniably delicious, rapeseed oil. It made for incredibly tasty, compulsive eating. The BLT sandwich is so ubiquitous in cafes here, but can be so greasy and heavy, especially if you take the BLAT option. I think the strong flavours work so much better as a salad. Speaking of praised chicken I've made it twice now and absolutely love it for how it tastes as soon as it is cooked, how much leftover chicken you end up with and the added bonus of leftover broth. So far we have been cooking it on a Sunday, cooking tiny pasta in the broth on the Monday and then eating the leftover chicken in a salad on the Tuesday. Tonight will be chicken, quinoa and squash - yum. 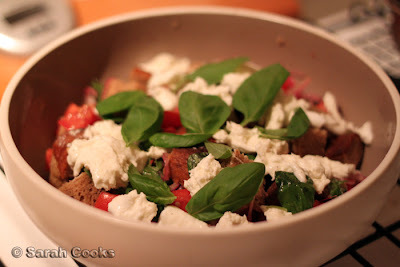 The panzanella wins hands down for me aesthetically! I'm impressed with you making so many various salads, maybe that's where I'm going wrong with Nigella, I really should remedy that! Thanks for the inspiration Sarah! Yay, Nigella does know her way around a salad. They all look beautiful, and while the chicken bacon and avocado salad sounds a bit obvious, man I wish I had a bowlful of it in front of me right now. And yeah, that oil, who named it? ?